I’m Liz, the new Curatorial Intern with the Georgia O’Keeffe Museum! I will be assisting with the cataloging of Miss O’Keeffe’s home in the beautiful land of Ghost Ranch this summer. I am very excited to be here and can’t wait to share our adventures with you! In preparation for our first on-site visit to Ghost Ranch, I read the book Georgia O’Keeffe and Her Houses: Ghost Ranch and Abiquiu by Barbara Buhler Lynes and Agapita Judy Lopez. I highly recommend this book for a thoroughly engaging view into Miss O’Keeffe’s homes in New Mexico. The book documents the original structures of both houses and explains the continual changes O’Keeffe made to them throughout her life to make each space her own. As I was reading this book, I inevitably thought about how we define the spaces we live in. Where we live reflects our interests, our sense of order (or disorder), and our creations of comfort. This can involve living in a place for so long that a person accumulates countless memories and things without even realizing it until packing up to move somewhere else. Or it can involve intentional decisions, much like O’Keeffe’s choices in this book, to create a space that truly speaks to an individual’s character and idea of home. It seems O’Keeffe’s idea of home centered around light and space. This is seen in both of her properties: the Ranchos de los Burros house at Ghost Ranch, which she purchased in 1940, and the Abiquiu which house she bought in 1945. She lived in the isolated Ghost Ranch landscape during the summer and the more convenient house in Abiquiu for the winter, essentially giving her the best of both worlds. These structures began as houses. They were simply buildings that could theoretically be purchased and, in the case of the Abiquiu property, restored, by anybody. Fortunately, this person was Georgia O’Keeffe who made deliberate decisions to make these houses into homes. O’Keeffe was able to call these houses her own because she made changes to the structures that reflected her priorities and visual aesthetic. I witnessed this light first-hand on a visit to Ghost Ranch last week where rays continually changed the colors of the mountains and ground to provide a new perspective with every glance. It is no wonder why O’Keeffe wanted this light to play off of every corner inside of her home to mirror the light outdoors. Imagine waking up, making a hot cup of tea, and sitting in this room as the morning light poured in and changed every floating speck of dust into a speck of glitter. It seems magical. That may seem like a contradictory statement from an artist whose artwork graced the walls of many galleries and museums. However, O’Keeffe’s intentional decision to keep her home simple makes it look like an area for reflection, contemplation, and appreciation of space. This is reflected in the photographs of her clean, open rooms where she often preferred the use of a single hanging light bulb, as seen below. O’Keeffe continued to adjust each space to meet her needs and complement her evolving self. Even when her eyesight began to fail in the 1970s, she put white carpet in her Abiquiu studio to better see her dark Chow dogs (Lynes 234). These thoughtful changes reflect the artist’s attention to space which ultimately made the Ghost Ranch and Abiquiu houses her homes. These homes now stand as iconic representations of Georgia O’Keeffe’s lifestyle which may even shed light on our own ways of living. Lynes, Barbara and Agapita Lopez. 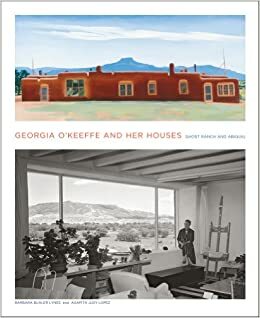 Georgia O’Keeffe and Her Houses: Ghost Ranch and Abiquiu. New York: Abrams in association with the Georgia O’Keeffe Museum, 2012.